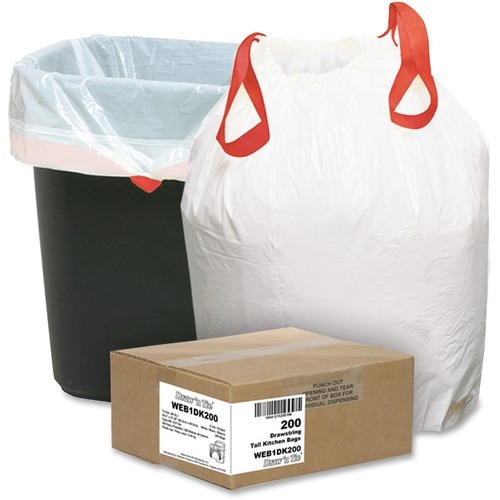 Webster Drawstring Trash Liner - Small Size - 13 gal - 24.50" Width x 27.38" Length x 0.90 mil (23 Micron) Thickness - White - Resin - 200/Carton - Welcome to TABS! Trash liners feature a convenient draw-and-tie top. Trash liners feature a convenient draw-and-tie top. Drawstring design keeps hands clean and away from trash. Made of super hexene resin. Liners have superior puncture-resistance. Assembly Required: No Bag Length: 27.38" 27,38"
Bag Thickness: 0.90 mil (23 µm) 0.90 mil (23 Micron) 0,90 mil (23 Micron) Bag Width: 24.50" 24,50"
Total Recycled Content Percent: 0% Width: 24 1/2"